Welcome back after the half term break which we hope you all enjoyed. Our new children have settled in really well. We know how tricky it can be to start with but are impressed with the ease in which they have adapted and begun to make new friends. Two new children will be joining us this week, Louis and Noah, and we are sure they will settle equally well. Unfortunately, Inga Bauer has had to leave due to other work commitments, so Lara and Yvonka will be alternating their days to cover her Tuesday morning slot, thus enabling forest school outings to proceed as normal. A new rota has been distributed to all so please ensure you check which days your child is due to head out to the woods so they come suitably attired. A group of our Monday children have been enjoying visits to Moorlands Lodge Care Home in Hindhead, where they have worked with 12 ladies and gentleman from the home on activities including art/craft and cooking. The children and residents have benefitted greatly from these experiences and, as a result, we will continue with these visits for the foreseeable future. Everyone should have received an order booklet for this top-quality gift wrap and accessories. Spares are available in reception if you have misplaced yours. The deadline for returning your orders via the nursery is Thursday 1st November. However, online orders can still be placed but you will incur a small postage and packing cost (and raise less for the nursery), cashback from these purchases goes towards the costs associated with the children’s Christmas party! 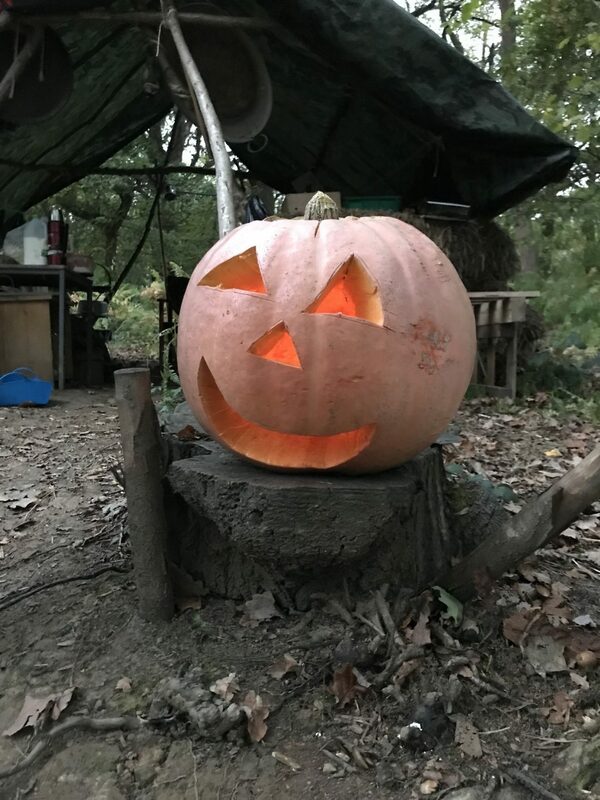 Whilst we love to provide the children with these little extras to add to their experiences, as we haven’t been able to run the Pumpkin Party, we need to find ways of raising funds to pay for the Christmas party – otherwise it probably can’t go ahead this year. Bonfire party – Sunday 4th November from 3pm at Autumn Woods. Gates open from 3pm. There will be all sorts of forest activities to enjoy with fresh food being cooked and available and Sherwins serving drinks from their horse box bar. At 5pm we will have a little procession to light the bonfire and to finish there will be Catherine Wheels at 6pm. This will be child and dog friendly with no loud bangs. Please advertise widely for us as this is a big fundraiser for the nursery. Please note entry is by ticket purchased in advance and there is absolutely no vehicular access to the site. If bringing a car, please do not drive down Muddy Lane and be mindful of our neighbours in the village. It is also highly recommended that you bring torches as it will be dark before 5pm! Back by very popular demand is our Wreath Making workshop. Festive drinks and snacks will be served during the session whilst you create a beautiful Christmas Wreath to take home. All materials and supportive guidance provided! Places are very limited so do book early, tickets are £28. Forms to complete to book your space are available at nursery. Most important amongst the various planned events is our fabulous Nativity Play which the children love to put on for family and friends in the church. This year it will be on Wednesday 12th December at 10.30am so please make a note on your calendars and invite family and friends to come along to watch this special performance, and join us afterwards in the hall for refreshments. A letter will be distributed shortly to all families with more detailed information about our Christmas arrangements. Due to the staff needing to be on-hand for the children during the morning, we will need parents to help us with preparing for, and helping with teas after the performance, and collecting raffle prizes from local companies. Please let Kate know how and when you can help us with this much-needed support. In the meantime, please note that the dress rehearsal is on Tuesday 11th December and all children will be needed during the morning, but precise timings will be shown in the letter. The final event of the year is the children’s Christmas party which we hope will be on the last day of term. All children are invited to attend from 9.05am. Details for the day will be included in the letter mentioned above. All of the children have been incredible with arriving and changing in preparation for the day. Thank you to everyone who has helped with this very important aspect of school life. Please remember if you are going to be late, or your child is not going to be coming in on their allotted day, to telephone the nursery (01428 658931 or on the mobile 07789 987280) before 9.30am as it is our statutory duty to know your child’s whereabouts if they are not with us as expected. Please ensure that you inform us, in writing, of any changes to your contact details as it is mandatory that we have up to date details in case we need to contact you urgently. You can forward this via email to Liz – admin@grayswoodnurseryschool.co.uk – write a note and leave it in an envelope in the staff box. It may seem rather early to be thinking about the next academic year, but we will be distributing forms to families of children who will be attending nursery next September so that we can understand which days you will be requiring. This helps us with planning for the next year and with allocating spaces to new families on our waiting list. Please ensure you return your completed forms by the deadline. Thanks. Also, we do have a couple of spaces available for this year if you would like your child to do an additional day. As the temperature is dropping, please can you ensure your children come with a full change of clothes, a hat, gloves and warm socks which will fit inside their wellies if you have not yet purchased a pair of Warm Wellies, so that they remain snuggly during these outings – we can always help them remove a layer if they become too warm. During the winter it does also get quite cold inside the hall too, as we continue to provide free-flow opportunities to the outside, so please bear this in mind when dressing your children on any day! Thanks to everyone who has named all their children’s clothing, footwear, lunch boxes and water bottles – it has helped enormously with ensuring the correct items go home (or in some case, come back!) to the right child. We do, however, still find that there are water bottles that are nameless which do not get collected. We would prefer not to have to throw these bottles away, so please may we remind you to check the green crates. Thank you to everyone who attended. It was a super turnout and we hope that you all found it useful. We have had some volunteers come forward to assist us with fundraising ideas and activities as a result, which is very much appreciated. Fabulous Me vouchers, special family events etc. Fabulous Me vouchers are either on the table at drop off or in reception – do fill one in for your child to celebrate something they have done at home, however big or small, and these will be included in their profiles. Also, if you have a special, or family event, please send in some photos for us to share at circle time. There are currently nine members of staff at the nursery. Miss Maureen visits on Mondays for music and movement and Bollie visits on Tuesdays for Playball sessions. Unfortunately Sue Bartrum is still away from nursery recovering but we do hope we will be welcoming her back soon. The committee work very hard to run events and fundraising activities on behalf of the nursery so please do help them out with this valuable task. The Nursery is not the place for poorly children. If your child has been sick or had an upset tummy they must remain away from nursery for a minimum of 48 hours and not return until they have had a normal (for them) stool. As a general rule, children taking antibiotics should not be at nursery. Please ask us if you are unsure when your child should return to nursery after an illness. Please keep us informed of your current contact details particularly mobile numbers. It is essential that whilst your child is at nursery someone is available to collect them in the event of an emergency. Please ensure if you are unavailable someone else is able to be contacted and collect your child. The children are not able to play with their own toys at nursery. Soothers/comforters ie soft toys and muslins may be kept in the basket by the door, or preferably in their bags. Dummies are not allowed in nursery under any circumstances. Please do not let your children wear jewellery to nursery or bring small toys etc. As a guide children should not bring to nursery items which could fit inside a traditional 35mm film container.